The new oval-shaped SGH-E330 mobile has arrived in stock! The feature-packed Samsung SGH-E330 phone holds an impressive array of functionalities : colour dual screen, built-in digital camera, integrated antenna, photo incoming call identifier and more. 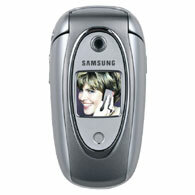 Coolnewmobile - Offering the latest Contract Phones including the Samsung E330 at the most competative prices around. We offer fantastic mobile internet phones all with FREE text messaging*, If you want an O2 mobile phone why not buy it now from O2. They also have some good deals on the Samsung E330.